I stopped by Lettuce Lake park today for a couple hours. I took some 'hopefully decent pictures' that I'll share later. 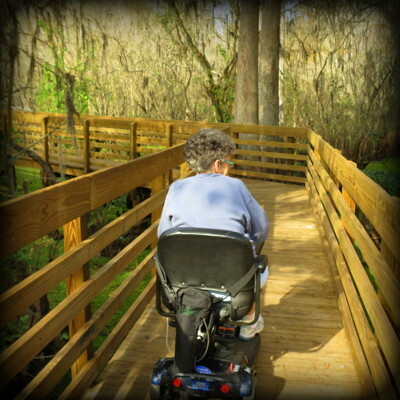 This photo of my mother was taken November 2012 at the park. There's so many memory's at Lettuce Lake, not just of my mother but in general. Countless people have experienced the best and worst life has to offer at the park over the years. I have seen three proposals on bended knee and been with people grieving a loss as well. I hope everyone up north that the weather settles down and spring starts to show up and sets up house. By the way, we know how life can move so fast. I was going though some of my photo's and came across this entry Seems like yesterday everyone was wishing a happy 2017! Time fly's like an arrow. Fruit fly's like a banana. Good and touching narrative accompanied by this 'fond memory' capture of your late and beloved mother, Alex. To me a confirmation as well that a late beloved one hasn't gone forever as long as she/he still lives in the heart and mind of relatives and friends. It's great to have a place where one can go and sort out some thoughts Alex. The one's that can keep their memories intact, are the lucky ones. Time sure does fly and I had to laugh at your quote.